Rendering is the act of drawing an image or text on your screen. Ultimately of course, you are concerned about rendering on your visitor's screen. The first two buttons are labeled 1 and 2, for color 1 and color 2, the colors of the two endpoints. The color 1 button will become active when the shading supports 2 colors -- anything other than a flat color. If they are labelled Cnt (Contrast) and Brt (Brightness), it may be because you may have an image selected -- they don't allow gradient fills. Try selecting instead our "Shaded Title" just above. 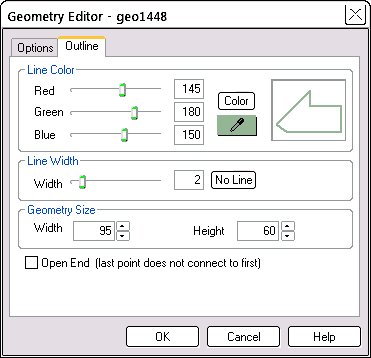 To set the endpoint colors, select a button, either 1 or 2, then adjust the sliders for the color to associate with that endpoint. Cyl cylindrical: The color changes from the middle outwards, along the horizontal axis. Select the Shaded Title above and try these buttons, while adjusting the color sliders. These are also called RGB sliders, short for for Red, Green, Blue. The bottom slider, Trans, is used to adjust transparency. Use it to adjust the transparency of either or both colors 1 and 2. For color adjustment, use the left/right keyboard arrows to nudge the slider, type the values into the adjacent edit box or use the eyedropper. For linear and cylindrical shading, adding 90.00 or 270.00 degrees of rotation to the object via the Quick Editor > Object tab will change the direction of the graduation -- shown in the examples above. Other options are 180.00 degrees of rotation to provide a complete reversal of the graduation. This has a similar end result to using the Flip button in the Quick Editor > Shading tab. When you drop, the object selected, or any text you type will take on the new color. The color dialog (e.g. 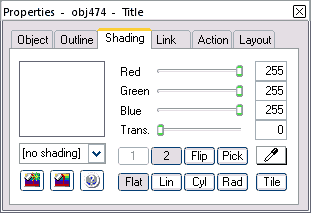 Quick Editor > Shading tab > Pick) is a Windows standard, used in many other programs. It acts the same there too. It is fairly easy to use, but it is not clear how to select more than one custom color. The trap is that if the triangular slider is set "no luminance" (slider at its lowest) you can click anywhere in the large color window and nothing seems to happen. Any hue at zero luminance is black! You can set a sequence of custom colors by looping through the steps 2 to 7. Each Add To click will fill out the next custom color in sequence -- continuing on from the color box selected in Step 2. The first two examples also show rotation. The last example is done in the Shading Editor where you can set the origin of radial shading -- the origin does not have to be in the center of the object. Click the Transparent Flat Shaded Title above -- it's not really transparent -- yet! Move the title so that it is on top of the blue rectangle to the right. Transparency mapping is similar to transparency except that the transparency is weighted towards a color you define. Transparency mapping allows you to completely "wash out" certain colors, while transparency fades out all colors. 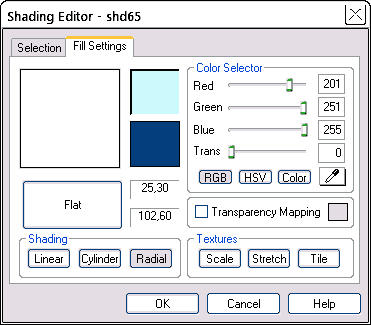 Click OK to exit the Shading Editor, accepting the settings you have made. Now you can return to the Quick Editor > Shading tab and make all the usual adjustments to colors and standard transparency. Or you could continue using the Shading Editor. Click OK to accept your changes and exit the Shading Editor. 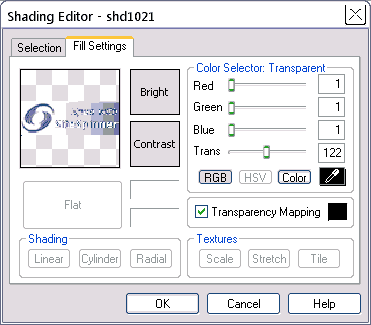 The Quick Editor > Shading tab has many of these settings too. It does not have the HSV color model, nor can you adjust the origin of the color on gradient fills. As we use the term here, texture mapping is the process of copying a pattern (texture) from an image, and using it to color an object. Any of our usual image files (PNG, PNG 8, PNG 32, GIF, JPG, BMP) can be used as the source of the texture. Apply texture to an object by Scaling, Stretching or Tiling the source image. A Scaled texture is scaled to find the best fit on the object without distorting the texture. This may leave some areas of the object uncovered -- these will be filled with the background color. A Tiled texture is repeated at its actual size until the entire object is covered. Return to the Shading Editor and select the Tile Texture. Select the file "brick.png"
Click OK to exit and view. The downside of anti-aliasing is that it can make smaller objects look fuzzy. If in doubt, try it both on and off -- pick the one that give the best results. Also, you are anti-aliasing against a particular background, often white -- you may have problems if you then use the same image against a colored background. Example. Rendering is the act of drawing objects on your screen. Re-rendering is the act of modifying an object in some way, then drawing it again. In practice, this means that the re-rendered object will require an image file in order to be displayed. One common application of re-rendering is to make a permanent group of two or more related images, then place re-render on for the group. This produces one larger image file instead of two or more smaller files -- often more economical. The shadowed title at the top of this page has this treatment. For more complicated shapes as we have been using here, re-rendering on or off makes no difference to the resulting image file -- one is always produced. However, for straight flat-color or tiled rectangles, if you put Anti-Alias and Re-Render off, no new image file is produced. This has advantages if you want a large image that you can make from a small tile. A little bit of code which SiteSpinner looks after, and a small image file are all you need. It is possible to apply a tiled background to your whole page, or part of a page. See page backgrounds. For GIF the background, one color, will be truly transparent. For PNG 32, the background colors will always show through the transparent sections of the image. So there is no need to simulate transparency. If the format does not support transparency (PNG, JPG or BMP) then the background will be filled with whatever color is set for the Page Background. PNG 8 and GIF are the only formats that can use transparency that will work on all browsers. Regular PNG (PNG 24) does support transparency but since not all browsers respect it, we do not use it that way. PNG 32 supports 256 levels of tranparency. PNG 8 and GIF are 8 bits-per-pixel formats. That means they can only have a maximum of 256 colors so you may see some loss of color on larger images. If you import a full color image and then change it to GIF or PNG-8, SiteSpinner will choose the best 256 colors. That will minimize the loss of color. For GIF and PNG 8, true transparency won't show until you preview or publish. Preview and look at the images against the bricks and see how they differ from their workpage appearance. In each case, the image immediately below is an exact clone -- an identical image using the same image file. Notice the improvement with PNG 32 on the right. PNG 8 and GIF show an issue with anti-alias too.  The bottom images are anti-aliased against a white background, so pick up a halo of white around the logo part of the image. This is not a problem when the same image is used against a pale background. However, when placed against a much darker background, the bricks in this case, the anti-alias shows. If this is a problem, one solution is to use another anti-aliased image, this one anti-aliased against the colored background. Another solution is to use the PNG 32 format.